It is the near end of the year and the comic book series of The Walking Dead has reached new levels of storytelling. From the introduction to The Commonwealth which holds about 50,000 survivors, to the different philosophies between Rick and Pamela, to Michonne finding her daughter, and to Rick and Dwight’s conflicts. This year there were moments that divided the opinions of readers and fans that have been talked about all year and I put together a list of the top 15 moments of the comic series of The Walking Dead of 2018. This list also has some spoilers so if you are not caught up, Read the issues before reading the list. Before I do, take a look at what made the list last year right here. After Sebastian tried to make a move on Yumiko, Magna jumped in and tried to stop it. But that did not work since Sebastian pushed her down. Then The Princess points her spear to him as Sebastian orders the Commonwealth soldiers to arrest her. That was not working either as she fought every single one of them. This was a cool scene and by this point, I warmed up to her character much more than her debut last year. The scene stopped when Mercer threw his hatchet towards her hand for her to drop her spear. The Oceanside has been first mentioned way back in issue #139 which was about almost four years ago. It has never been seen before until Rick took Pamela over there in this issue. The full two page spread shows a beautiful sight of the ocean with a sunset along with a few houses. While there is a dark setting of the world of The Walking Dead, there are a few high points of scenery and this is one of them. Politics is something I would have not ever encountered in this series, but it is a reminder that the old ways can still happen even in a post-apocalypse world. Michonne used to be a lawyer before this all happened and Lance thought that it was a good idea to give her a job as a lawyer. When Michonne arrived to another section of The Commonwealth, she and her daughter sees that the soldiers are beating down Anthony who also had an argument with the soldiers before the beat down. It was also here where Michonne realizes that one of the soldiers was Jerome who she has meet earlier in the issue. It is also here that Lance tells her that she has to defend the soldier’s actions in the trial and we have seen the early stages of the trial as of now. Sebastian is the son of the leader of The Commonwealth Pamela. He seems to get away with anything and tries to abuse his status to people who are under him and we got a pure example of that when he lashes out at Mercer for not keeping a closer eye on him while he was with Kayla. But little did he know, Mercer already killed the lurking walkers before he even opened his mouth. I so far, am mixed about the character, but there is room to see where his story goes. After sparing Negan’s life way back in issue #174, Maggie and Dante gets closer and while they were kissing in the barn at the Hilltop, Sophia walks in to see it happen. I will talk more about that in a moment, but to see Maggie finally moving on and wanting to be happy is a good feeling even though she said it herself that she is ashamed about it. As soon as the cover of this issue was shown three months before it’s release, I had a feeling that these two would get together. Mercer and The Princess were clearing walkers until they realize that they are boxed in and surrounded by more of them. After the rest were killed, Princess suddenly kisses Mercer as the thought that they were having a moment. A few issues after this, they become a couple. Sure it’s odd for a visual standpoint, but love is love. The comment Pamela made upon arriving Alexandria about how much of a “dump” the outside gates were to what she is used to is eye catching. She has it so good at The Commonwealth that she wants to look down on Rick. But not only that Rick’s vision of a “New World Order” is different than hers, but she sees how the communities survive without too much of a law and order. Rick introduced her to The Hilltop, The Sanctuary, The Oceanside, and The Kingdom with stories about past characters that used to be there. This was very nice to see. Dwight who has been on Rick’s radar since Issue #169 has gotten arrested by the Commonwealth soldiers. He intentionally did this so he can send a message to Rick that the entire community needs help and that they are just smoke and mirrors. Dwight who has been second in command for Negan for years, sees the same in him as he does to The Commonwealth as he thinks that it is a lust for power and that their leader Pamela is doing this all for show. Dwight and Rick had a few moments talking about their different views of the place, but what is coming for Dwight will prove otherwise. Right after Sophia caught Dante and Maggie together, they had a talk and she was upset that Maggie did not tell her about their relationship. Maggie also insisted that she wanted to feel happy and loved again and although she will never forget Glenn, he would have wanted her to move on as well. Timeline wise, it has been almost fou years since Negan killed him and she has not healed from that day until they first spoken a few issues prior. This felt like a mom to daughter talk after the husband dies and it was an emotional one. This very large area which is made up of communities together in one is a sight to see on The Walking Dead. It feels like a normal day over there to see a football game, people eating out at restaurants, people eating ice cream etc. The survivors that went there were stunned to see all of this and they wanted to know if it was too good to be true. Seeing Lance say to them that there was over 50,000 residents over there made my jaw drop. 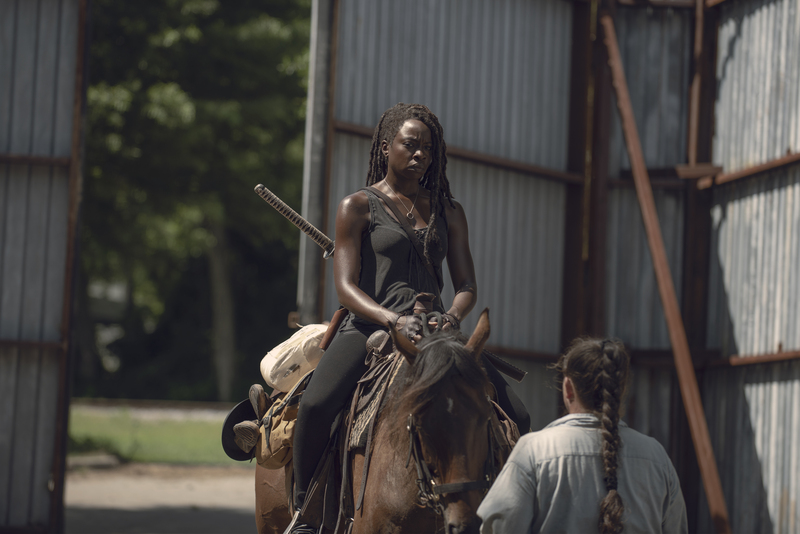 This is the second time that Michonne gave up her sword and it looks like it is for good this time as she decided to stay at The Commonwealth since her daughter is now there and that she has a job there as a lawyer. Eugene was puzzled by this but he understood her. 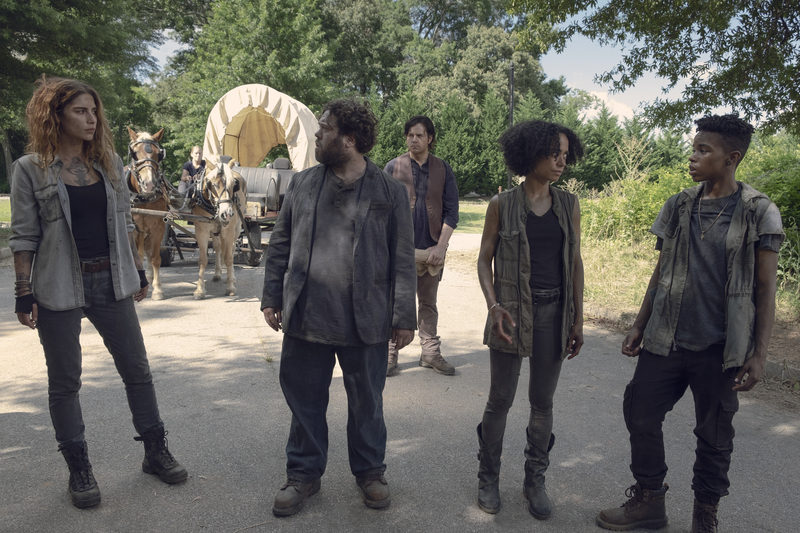 Michonne gives Eugene her sword right before Pamela and a few others along with Eugene, Magna, siddiq, Yumiko, and The Princess go back to take Pamela to Alexandria. A riot is something I wanted to see on The Walking Dead for years and we finally got it. Once the news about Michonne having to defend Jerome and the Commonwealth soldiers for killing Anthony come out, the residents did not like that at all. A full fledged riot escalated as the soldiers had to use riot shields and nightsticks to stop the residents from rioting. But that only worked for a while until Pamela arrived to see the riot along with Rick and his group that is seeing this for the first time. Part of the riot mob beat up Michonne and Jerome until it was broken up by Dwight, Mercer, and the soldiers. At the court hearing, Michonne defended the soldiers but asked the judge to drop all charges and the judge will consider it. Talking about this as I am reading it is mindbending for The Walking Dead as never in a million years would I think that a riot and a court trial would take place in this series. After Michonne found a missing poster of herself that was written by her daughter Elodie, she did not waste any time to go look for her. Lance thought that she could be dead, but Michonne knew in her heart that she is alive. After the meeting between Pamela and the survivors, Michonne asked her if she can see her daughter. We find out that she works at the bakery and once they seen each other, Elodie dropped her cake and hugged Michonne. This reunion is one of the best moments of the comic series and I loved it. I did not see this coming as it was a shocking moment for the last issue of 2018. Dwight who was about to kill Pamela so he can show Rick the way the community should be run was shot in the head by Rick. This whole thing happened because Michonne asked Pamela to come talk to Rick and Dwight without letting the two of them know that she was coming. Pamela overheard the conversation before she and two soldiers entered the room and she asks Dwight to leave the place. Dwight refuses and after some talking, BAM. Dwight was one of my favorite characters since his debut back in issue #98 and to see him go was very unexpected. Rick also blames Michonne for this because Rick could have handled it and he will now never forgive her for this at all. I told myself that this is one of the biggest non death cliffhangers I have ever seen on The Walking Dead and I also said that no moment for the rest of this year will top this. As the group are introduced to Lance, he leads them to The Commonwealth. But on their way there, they stop by “the wall of the lost” as many residents place missing people posters of their friends and families. Of those posters, one of them was written by Elodie This made Michonne cry as she thought that she was dead the entire time and that she wants to look for her right now. The poster also featured a pre-apoclapyse Michonne when she used to be a lawyer and that symbolizes that no matter how long you have moved forward, your past will come right back to hit you. This is an amazing moment and I would love to know how they will pull this off on the television series. There’s no denying The Walking Dead is enjoying a resurgence this season. The Obliged was another fantastic episode. Michonne was heavily featured tonight as we see her life in Alexandria running everything in Rick’s absence. Michonne is doing a little of everything from settling gardening disputes, playing with Judith, and tending to the sick. And when she’s suffering from some sleepless nights, it’s time to go kill some walkers. That led to an interesting scene as Michonne spots a black walker hanging from a tree. Now Michonne has a new problem — Negan won’t eat. He’s on a hunger strike as he wants a conversation. He chats Michonne up about his wife dying from cancer, their desire to have a child like Carl and ultimately how her death helped to not make him weak. Humble Negan is a far more interesting character this season. Season 8 Negan never had to resort to mind games like this strike to learn Lucille’s location. Negan tried to find some common ground with his dead wife and Michonne’s dead children, but Michonne wasn’t biting. Still, Michonne’s growing unease whenever she sees a bat is telling. There really wasn’t enough time to spend on Gabriel and Anne this week and their subplot felt very under served. Anne seemed to consider giving Gabriel the old tie ’em down and let a walker devour them trick she pulled on Negan, but had a change of heart. She knocked him out just long enough to roll out. Gabriel broke down presumably at the thought of no more sweet, sweet junker loving. While last week made it appear as if Maggie and Daryl were heading to kill Negan immediately, she went back to Hilltop to get supplies while Daryl returned to the camp. But now it’s payback time. Jesus seems torn on his loyalty. He accuses Rick of making a bad call in keeping Negan alive, yet sends a warning to Rick that Maggie is headed to Alexandria. Pick a side dude! Rick’s got enough problems as Eugene tells him the bridge is a wash. A new storm is coming to basically wipe it out. 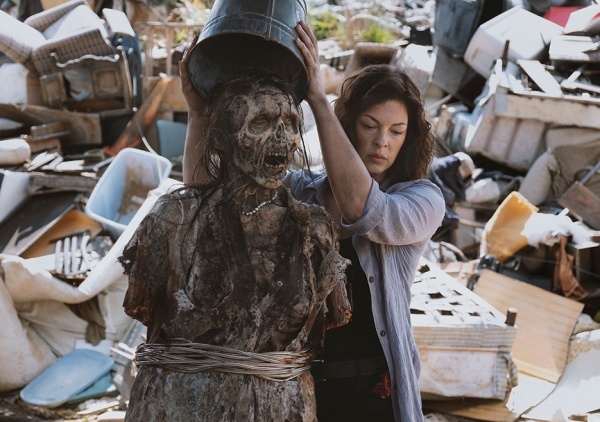 I’m wondering if the plan is to give Rick a death like Madison from Fear the Walking Dead where he gets washed away, but with no body there’s some chance he’s still alive. That would give Judith a reason to stay with everyone at least. The only problem with Rick’s pending departure is it’s placing the burden of his focal storyline — that the Saviors can be redeemed — onto other characters. Carol basically told Rick she wasn’t interested in being the Saviors’ keeper any longer and they were going to have to fend for themselves. These conversations are really starting to feel like goodbyes for Rick. He left both Carol and Eugene with a comforting pep talk and encouragement. Upon learning the news of Maggie’s march, Rick sets out for Alexandria, but Daryl offers him a ride. Rick quickly realizes something is up when Daryl misses the turn. They get into a tussle and fall into a conveniently placed cliff. Hard not to agree with Rick and wonder if Daryl set it up. One huge improvement this season has been the writing and this pit conversation was a highlight of the night. Daryl called Rick out for not avenging Glenn, but saying he wouldn’t be alive if it wasn’t for him. Rick countered reminding Daryl that he spared Dwight, but Daryl dropped the Oceanside bombshell. Rick explains that if Negan dies, he becomes a martyr and all those people will have died for nothing. Daryl says Rick doesn’t have enough faith in their crew and that he’s chasing something for Carl that isn’t meant to be. Daryl has a point. The strength of the writing is that neither guy comes off like an idiot and they both have viable points. However, we got the first live F-bomb on The Walking Dead and it came out of nowhere! They don’t fully hash things out before another fracas breaks out at the camp. Jed and the Saviors have somehow figured out Oceanside killed their crew. That’s some impressive powers of deduction. Carol’s Kingdom troops get ready for a brawl and enough shots ring out to attract one of the two nearby walker hordes. This is not good news. But for those of us who love creative walker death traps, The Obliged delivered again. Rick and Daryl trying to climb out of the pit while walkers slide down was pretty ingenious. The walkers always come off so much more dangerous when they’re a menacing obstacle capable of wrecking any great plan with their overwhelming numbers. Rick pulls Daryl up after telling his ‘brother’ to take his hand. I don’t know about y’all, but I’m going to miss the Rick and Daryl brotherhood immensely the rest of the series. With the horde closing in, Rick spots a horse and uses it to lead the horde away from the camp. Daryl thinks now is the time to blow up the bridge, but Rick isn’t having it. Daryl seems to understand Rick’s grand purpose for the bridge, which is still escaping me. In a nice callback to the first episode, Rick’s horse gets spooked by the walkers and he gets thrown off onto a cement block. Maybe he avoided a broken neck, but he’s impaled. As both hordes slowly converge, this definitely looks like the last stand for Rick Grimes. The Obliged set up a strong Michonne/Negan conflict, let Rick and Daryl reaffirm their brotherhood and set the final steps in motion for Rick’s death/departure resulting in another strong episode.